It has been a very busy weekend for the Volunteers in Liverpool. Starting Friday April 20th at 0315 hrs Liverpool Engine 2 was alerted to the Mattydale Fire District for a possible large outdoor fire at the OCRA Transfer Station. C1 (Payne), Car 4 (D/C Manley) and Engine 2 (FF. J.Santoro) marked enorute shortly after dispatch, along with Mattydale Cars 2&3. Crews were back in service within 30 minutes of investigating. Saturday April 21st at 1329hrs the Volunteers were alerted for a MVC/car into a building on First Street in the Village. C4 (D/C Manley) arrived, confirming two cars, with one of the vehicles striking a building. Rescue 1 (FF. J. Santoro) arrived, secured the vehicle and checked the building for any structural damage. The incident was turned over to Village Codes, and crews were back in service within 25 minutes. 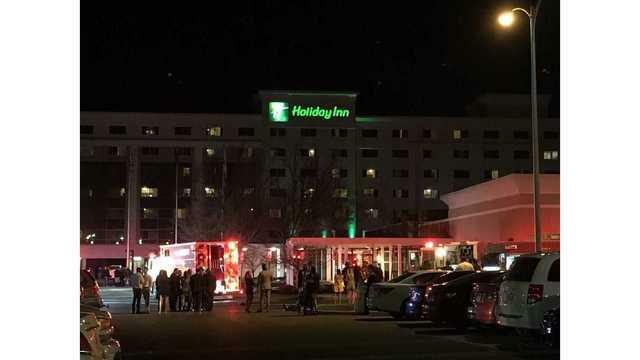 Around 2053hrs the Volunteers Of Liverpool were alerted for a Fire Alarm activation at the Holiday Inn on Electronics Pkwy. C4 (D/C Manley) arrived first to a 6 story hotel, in the evacuation process, with nothing showing and established command. At this time 911 updated C4 with a few callers reporting smoke on the 4th and 5th floors. D/C Manley requested the alarm be upgraded, adding Moyers Corners Engine 31, Mattydale Quint 3, North Syracuse Engine 6, and Solvay Rescue 11 to the assignment. MCFD E31 arrived first due and went directly to the standpipe side of the building bringing in their own water source. Liverpool E1 (FF. Heneka) arrived second due and was tasked with investigating the calls of smoke on the 4th and 5th floors. Liverpool R2, and Solvay R11 arrived shortly after and assisted crews working inside, searching above floors. Also onscene were Liverpool R3, Mattydale Q3, and NSFD E6, they also assisted with investigating. Crews operated roughly just under 1 hour on scene, and the incident was turned over to building maintence. Along with these calls, our volunteers have also responded to numerous EMS related incidents in the past two days. We cant thank the men and women of Liverpool enough for what they do day in and day out!